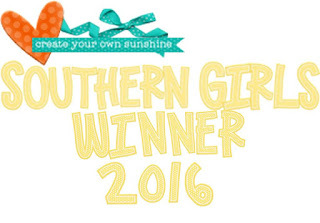 This year, I have decided to have a go at blogging for the first time. It has taken me until the end of January to give blogging a go but I have been reading other peoples' blogs for some time and love the idea of everyone sharing ideas and learning from one another. My aim is to complete at least one blog per month so we will see..
With the weather being so hot, it has been a great month for spending the day crafting. At the end of last year, I started to get into Artist Trading Cards (ATCs). I love their size and the hunt for small embellishments. The swapping part is fun,too and my file is starting to have a nice collection of art and ideas in it. I have joined several Facebook ATC groups and made a Boat and 70's ATC set for some swaps. This is my card for the Boat swap. I created the background first using Tim Holtz Distress Stains. 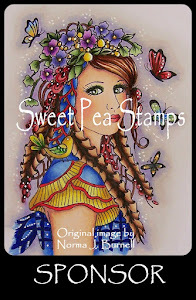 I stamped the image from Artistic Outpost on a separate piece of paper and then coloured them with Copics before fussy cutting and placing the image on the card. The little heart brads had been in my stash for ages. This is my card for the 70s swap. I used a photo as the base and painted over the image with a gesso wash. Next, I drew the outline with a fine liner pen and then got out the Copics, Stickles and Prismacolors. 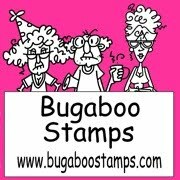 A friend introduced me to Betty Stamps just before Christmas. I was after more images to colour now that I have some Copics and the images here are gorgeous.They are available as stamps or digis. It was my first time for using digital stamps. 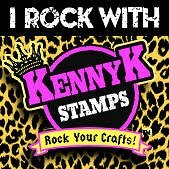 I also love her tutorials and the ideas I get from many talented people who create using these stamps. The card above was made for the December Challenge. Again, out came the Stickles and the Copics and of course, I had fun fussy cutting. The Copic markers take some practise and the hair on my image leaves a little to be desired but I am learning! I'm glad you like doing the ATC swaps. I always love seeing everyone's interpretations of the themes. I also love getting something in the post. Keep trying at making a blog entry. It just takes some time (and patience) to get started. I'm only very basic myself at the moment as a newbie.